This Heavy Duty Notary Embossing Seal comes with a lifetime warranty and is guaranteed to meet all state specifications for notary supplies. This is the ideal product for those notaries who need to reach and emboss up to 2 1/2" in to the page. This Long Reach Notary Embosser not only reaches farther in to a document than a standard embosser, but is also a work horse. If you are a notary that authenticates dozens of documents a day, this product may be the one for you. Light weight given its durability, this Long Reach Embosser has the ability to reach 2 1/2" from the papers edge for finicky documents. HOW IS THIS UNIT HEAVY DUTY? 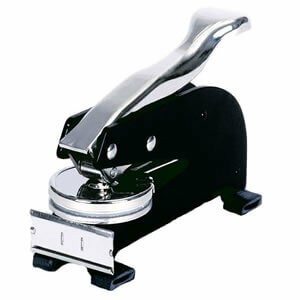 The Heavy Duty Long Reach Notary Embossing Seal is a hard-worker. Not only will it allow beautiful unblemished impressions without the force of traditional hand held notary embossing seals, but it also has the capabilities of embossing documents that are up to 60 pounds! With the option of replacing the insert if your name changes or commission expires, this Long Reach Embosser is the only unit you will ever need!